"In the ninth inning, one thing I was thinking about was that bucket of water," Montoyo said. "I didn't know when it would come. … They got me by surprise." 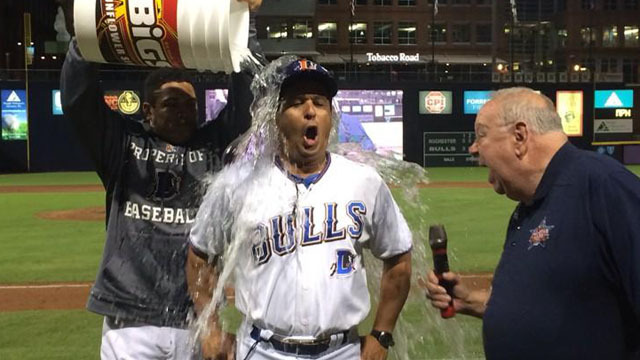 Infielder Ray Olmedo did the honors, showering the Triple-A Durham skipper to congratulate him on becoming the Bulls' all-time wins leader with 614 victories. Montoyo took sole possession of the mark with the Tampa Bay affiliate's 5-1 win over Rochester on Monday. "To do it with a great franchise like this, and right now to be the winningest manager, I'm very humbled by it, I really am," the 48-year-old said. "I want to win just like everybody else, but I never thought about numbers. I just do my job, that's how I look at it." The International League skipper passed Bill Evers, who managed the Bulls from 1998 until 2005. Evers is still a field coordinator for the Rays organization, and he and Montoyo are friends. "For me to pass a guy like Bill Evers, who when I come to this ballpark, I see his name retired, I'm honored by it," Montoyo said. "I never pay attention to my numbers and stuff, but I knew in Spring Training that there was a chance for me to pass him because Bill Evers told me. "I haven't talked to him yet. He might be out of the country. … I'm sure he'll call tomorrow, though. We're good friends. I know he wanted to be here." Montoyo began his managerial career with the Rookie-level Princeton Devil Rays in 1997, coaching the squad to a third-place finish and a 39-30 record. Over the next nine seasons, he managed at Hudson Valley, Charleston, Bakersfield, Orlando and Montgomery, all in the Rays system. In 2007, Montoyo replaced Johan Tamargo as the Bulls' bench boss, leading the team to an 80-63 finish and a trip to the International League Finals. The trip was the first of four consecutive appearances in the IL Championship Series under Montoyo -- the team won the title in 2009. After losing in the first round in 2011 and failing to make the playoffs in 2012, Montoyo's Bulls returned to the Finals and won in 2013 after finishing first with an 87-57 record. "It's all about player development," Montoyo said. "When it comes to this, I feel very lucky to have had many good teams through the years and many good players. It's been a good ride." The skipper said he'd already received text messages from a number of former players, including Fernando Perez, Elliot Johnson and Chris Bootcheck. Olmedo, who drenched Montoyo with a cooler of water postgame, is one of a few current Bulls who has played multiple seasons under Montoyo. Montoyo considers Durham's string of success a credit to the organization, particularly for its ability to field teams in the big-league and Triple-A playoffs at the same time. "That's tough to do, if you think about it," he said. "They have to take everybody they need, and at the same time, we're finding ways to win down here. That's just been awesome. From [Evan] Longoria to [David] Price, all those guys come to play here in Durham and they know how to win. I believe that's one of the big reasons we've done so well at the big leagues." Tampa Bay's No. 4 prospect Enny Romero earned the win, allowing one earned run on six hits over six innings. Romero (4-10) struck out four and walked three while slimming his ERA to 5.34. "Today was his best outing of the year," Montoyo said. "He had good stuff and he was throwing strikes with all of his pitches. "He was very consistent with his windup. … He throws 95, 96 [mph] and today he was over the plate. When he gets over, with his stuff, he will do well. That was good to see from him."